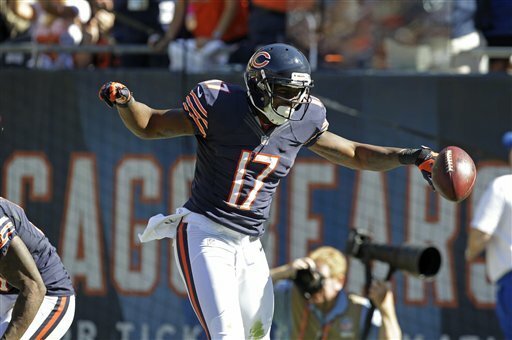 Alshon Jeffery enjoys his first NFL touchdown. 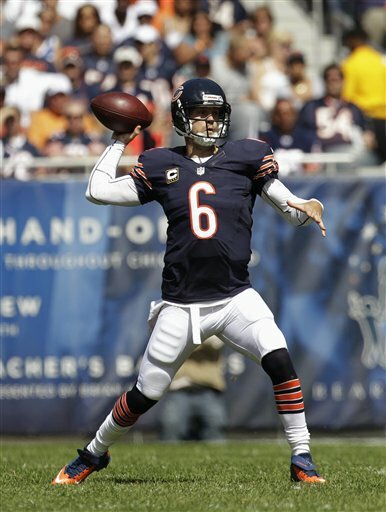 Bears QB Jay Cutler started slow but ended with a monster game. Now we have an idea of what this Bears offense can do, after quarterback Jay Cutler and his teammates beat the Indianapolis Colts 41-24 on Sunday. There is no doubt Bears fans went home happy — even though they may have squirmed in their seats early in the game. Cutler’s interception minutes into the first quarter resulted in a Colts touchdown, but then the Bears managed to right the ship. Amassing 428 total offensive yards, offensive coordinator Mike Tice mixed the pass with the run. The Cutler-to-Brandon Marshall connection had the Bears crowd on its feet with nine catches for 119 yards and a touchdown. When the Bears got near the goal line, twice it was new running back Michael Bush getting the call to punch it in. Matt Forte had 120 all-purpose yards, passing Gale Sayers for fourth place on the Bears all-time list with 6,338 yards for his career. Forte ran for 80 yards and a TD and his three receptions gained 40 yards. It was also a stellar day for the rookie Alshon Jeffery; he showed he complements Marshall, as he caught a 42-yard pass from Cutler for his first NFL score. The Bears offensive line did a good job after opening the game giving up a sack. They had two sacks overall and settled down after Cutler had to deal with the Colts defensive pressure in the first quarter. The Bears defense took on the NFL number one draft pick, quarterback Andrew Luck, and the revamped Colts. The Bears may not be happy giving up over 300 yards of offense. However, cornerback Tim Jennings seemed to enjoy playing against his former team with his two interceptions. He also batted a Luck pass in the end zone that wound up being a pick by safety Chris Conte. There was a lot of pre-game talk about Brian Urlacher’s playing status. For the record he did start, but Bears coach Lovie Smith removed his All-Pro linebacker in the second half. “Brian wanted to play the entire game. When we told him he was coming out, it’s not like he told us that it was a great idea,” Smith said. “He knows that there’s a big picture.” Urlacher was asked about being sidelined by his head coach, and acknowledged, “No, I don’t like coming out of the game. But that’s the head coach, I do what he says.” He finished with only two tackles. The one injury of note was a blow to cornerback Charles Tillman; he hurt his lower leg early in the game and did not return. His status is unknown for Thursday’s game in Green Bay. The Bears defense did get to Luck with three sacks; Corey Wooten’s sack forced a fumble by Luck that Julius Peppers recovered. Henry Melton tallied the other two sacks. In a funny moment after the game, Jay Cutler had a message for the Bears faithful: “Please, please, please let’s tone it down a little bit when we’re down in the 20. You’re more than welcome to yell and scream and do whatever you want to do after we score, but, please, let’s go ahead and quiet the stadium down and save it for after we score. Thank you. That’s my PSA.” What Cutler has to realize is that Bears fans are giddy with the new offense; they have been waiting a long, long time to see points scored in bulk. Of course, Sunday they hosted last year’s worst team in the NFL starting with a rookie quarterback — but a win is a win. Starting the season 1-0 goes a long way since they only have a few days before they travel to Green Bay and play the Packers on Thursday. The Pack took it on the chin from the visiting San Francisco 49ers 30-22. The Bears hope to add insult to the Packers with a double loss in a week. Now that would whet any Bear appetite.